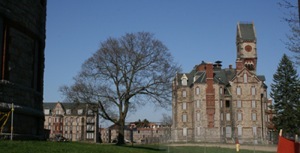 Independence State Hospital was the second state funded mental health hospital in Iowa built in 1873. It is a Kirkbride style hospital with beautiful stone masonry. You can see the notches in several of the stones where the masons chiseled. Independence is a operational hospital offering services to adults, adolescence, and children. It also has a specialized residential program, the Psychiatric Medical Institution for Children.